I spent this weekend with the Traverse ladies. We all did lots of work despite the heat! and coated it with flour paste again. When the flour paste was dry I crackled it and then painted it with brown paint. When I washed it off it looked like this. This looks better when you see it than in the photo! I also played with my thermofax screens on paper and on calico. Sorry you can't see the paper ones very well. I tore these up into squares and rectangles and with a few pieces of other fabric put them together with wall paper paste! and covered with a layer of scrim. Jan taught me how to use my sewing machine with encouragement from Cath. Still needs more practice! The great thing about working with a group is that we all spark off each other so as if it weren't bad enough that I had so many ideas last week, I have come home with loads more. Watch this space! I have so many ideas going around in my head for textile and mixed media pieces. And as ever I am over-thinking them rather than actually doing anything with the ideas. I started on this piece of cloth when I was at Studio 11 for the mentoring days with Christine. 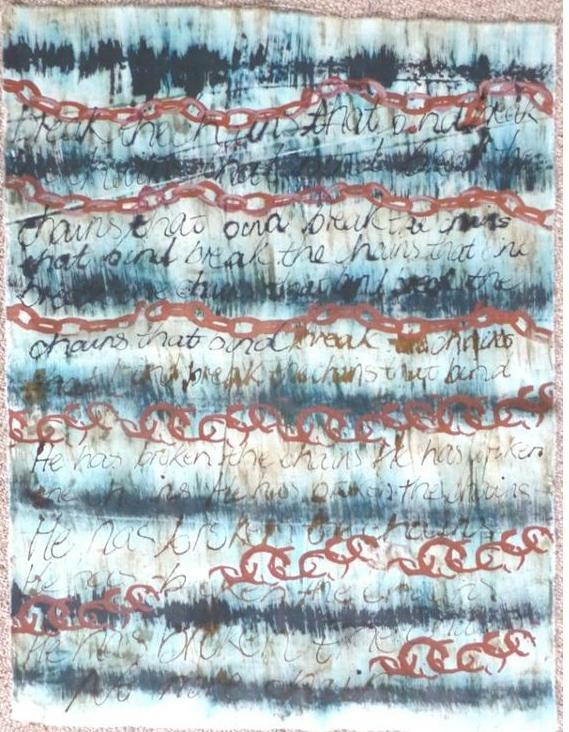 I had some Thermofax screens made of some drawings and marks I made of chains. I used fabric paint through the screens. The print on the bottom right of the fabric didn't work very well. It was supposed to look like a pile of chains. I decided to tear off the offending section! With a small brush I wet the inks that are on the fabric and lightly moved them to fill in the whitish gaps in the calico. Then using black and then brown ink I wrote on the fabric. Firstly 'break the chains that bind' in black and then 'He has broken the chains' in brown. I worked on it the way it is above because the lines looked like prison bars and the chains are dropping down on the right. It looks like this the other way up. And now I'm stuck. 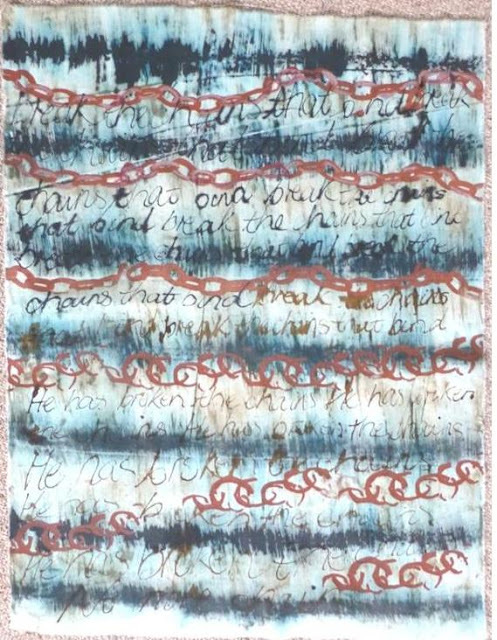 The choices are to stitch side to side on the upward lines of blue/black, stitch around the chain links or stitch the writing. Or any combination of the 3 or all of them. I also have in mind to make felt chain as a separate piece but now I'm wondering about making the felt chain links so they drop from the broken links on the right onto the floor where there are bits of chain. As a primary school teacher I frequently asked the children to 'take a line for a walk'. This usually involved scribbling all over a page with a pencil and then colouring in the spaces. Currently I am examining 'taking a line for a walk' in a sketchbook using India ink, brown acrylic ink and Koh-I-Nor Dye based Watercolours. I don't know whether any of this will lead anywhere in terms of a finished piece but that doesn't matter. I'm enjoying playing with line. Last week I went to Stroud to visit the DIS/rupt textile exhibition and to do two workshops that were each run by a textile artist who had work in the exhibition. The exhibition was spread over two sites - the Museum in the Park and the Lansdown Hall. This meant that there was ample space around each exhibit and made for great viewing. The exhibits were made from various media and were very thought provoking. The work for the exhibition was provided by members of the Textile Study Group and details of the exhibition can be found here: DIS/rupt. I drove down on Wednesday and spent the afternoon looking at the exhibitions and walking around Stroud. There were other exhibitions to see around the town as part of the Select Festival. There were some pictures of birds by Jilly Cobbe in a rather lovely cafe called Meme in George Street, where I had a chocolate explosion of Hot Chocolate and a chocolate brownie. Yum! The first workshop on Thursday was run by Ruth Issett called Disrupting Repetitive Pattern. This was really well prepared and we achieved an amazing amount in the 2.5 hours we had available. 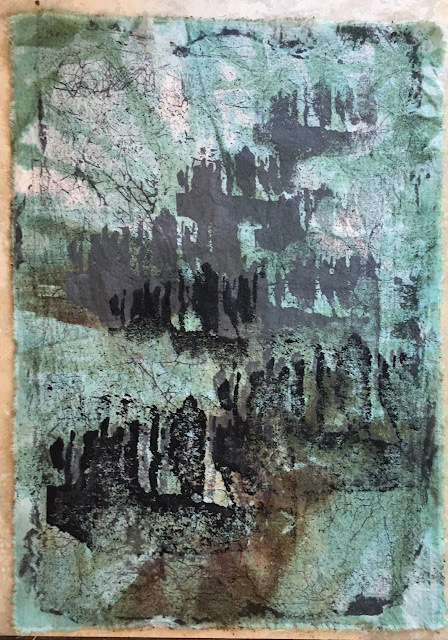 We did quite simple monoprinting with a limited palette of colours. I chose turquoise and lemon and later turquoise and yellow. At various points Ruth asked us to use black or white as a third colour. We started on calico. I ended up with this but I think I was a bit heavyhanded with the black. We moved on to Cotton Organdie which I loved using. You can disrupt everything you are doing because it folds so easily and holds the shape. This is the start of the second piece of organdie. I disrupted this by screwing up the organdie as tightly as I could, flattening it out and then printing on top of it. And then she gave us two pieces of her own dyed fabrics with a square of freezer paper on it. I printed over the top and then removed the square. I may have been a bit heavyhanded again with the white. There was a short break between workshops where I went out for another look at the Lansdown exhibition and had a hot chocolate with a friend. You can read about her view of the workshops on her blog. On Friday I did a little tour of Gloucestershire to view other of the Select exhibitions on the way home. I went to Painswick to visit a felt exhibition at ACP. The clothes were beautiful. Then I called at the Malthouse Kitchen & Bar where there were enormous drawings of children dressed as superheroes called 'Future Giants'. And then on to The Nursery at Miserden to view the sculptures. If you're ever down that way Miserden is well worth a visit. It's tucked away in the Cotswolds. It's one of those villages where the 'big house' owns the village. My final visit on the way home was to New Brewery Arts which had a few items for the Select Festival but mostly I went to see Emily who has a studio there where she make beautiful books. I had a lovely time and my head is full of ideas from both the DISrupt exhibition and the two workshops. And since the workshop I have continued to stitch and the piece now looks like this. Last time I told you about the mentoring days with Christine Chester and at last I'm getting round to tell you about my new, possibly risky, venture. I have been part of setting up a new textile group with Cath, Deb, Dia and Jan who I met on ExTex. Cath wrote eloquently about who and why we are Traverse: "Traverse is a newly-formed group of five textile artists, based in the Midlands, who came together after studying Experimental Textiles for nine months with Kim Thittichai at Inkberrow Design Centre; we intend to start exhibiting our work next year. The name ‘Traverse’ grew out of a sense of looking or moving sideways, to find different perspectives as we approach a theme for our work – we may not all travel in the same direction to get there, or use the same vehicle. Indeed, although our work is loosely described as mixed media, we each have our favourites, including working with paper, metal, hand-dyed fabric, felt, 3D and fashion, using heat, print, paint, and stitch. However, a large part of our ethos is to celebrate our diversity, share our various strengths and to grow together. 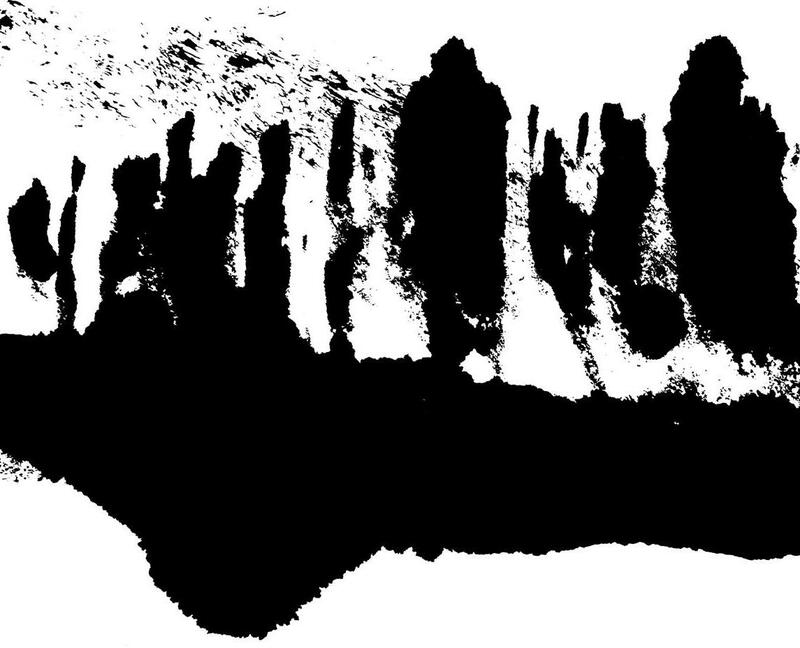 The title of our first exhibition is ‘Destinations’ and preliminary work so far is already revealing different perspectives on that theme - some based on maps, views of the Earth from Space and imaginary landscapes. The Latin origins of the word, destinare, ‘make firm, establish’, led to it meaning ‘being destined for a place’ and we hope that this, our first exhibition, will begin to establish our place in the world of textile art." She has an amazing way with words. I hope my work will match up to the dream. The working title of Destinations covers maps, journeys, places and travel. This is a very wide topic and as Cath said we are all finding different ways of looking at the theme. Before I went to see Christine Chester I had done a mind map - or whatever they are called these days - of all the things that interest me to work on. One of the sheets of marks that I produced produced some interesting sections. On the left hand side there appeared to be hunched up silhouettes. I don't usually put people into my art but since refugees are on my mind map I thought I would look at isolating this image. I cleaned the image up and have had it made into 3 different sized Thermofax screens. We had our first Traverse weekend together and I tried out some flour paste resist. This technique produces random lines on the fabric that have a map like quality. I have used the Thermofax screens on the fabric. I printed on other fabrics as well so I am interested to see where this takes me. I've also started making marks in a sketchbook with no end project in view. I'll keep you up to date with how things are going next month.